iPhone Mobile Dialer (SIP Client) is an amazingly created mobile application for iPhone. The SIP Client app features all those qualities and characteristics that the iPhone itself claims to have.The features and qualities which are amassed in the Adore iPhone Sip Client are as standard as the iPhone itself. It is fully compatible with all the latest series of iPhone and performs the marvelous job of commencing VoIP calls from the iPhone. 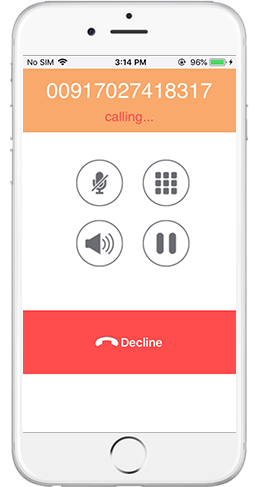 Woks on the SIP platform, the iPhone SIP client is easy to use and has a reliable and customizable interface that will turn your iPhone or iPod into a wonderful VoIP phone. With delivering the outstanding audio quality, the Adore iPhone Sip Client leads in the iPhone apps for VoIP Calling. In addition to the all normal features you will get in the Free Mobile Dialer Software available on the internet, you will get plenty of advanced features along with lots of customized designs. The licensed version of AdoreSoftphone Mobile Dialer can let you put your company logo and name on the front of this Mobile Dialer software. There are many different customizations for different mobile phones to suit particular mobile functionality.